1980 presidential election results. 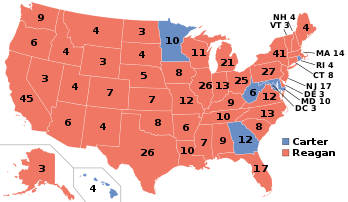 Red denotes states won by Reagan, blue denotes states won by Carter. Numbers indicate the electoral votes won by each candidate. The 1980 United States elections was held on November 4. These included the 49th presidential election, Senate elections (where 34 seats were decided), and House of Representatives elections (to elect all 435 members of the House for the 97th United States Congress). Other elections were held as well. The elections saw sweeping gains by the Republican Party in the Senate, House, and in numerous gubernatorial and state races. Republican former California Governor Ronald Reagan defeated Democratic incumbent President Jimmy Carter in a landslide. Additionally, the Republicans gained control of the Senate for the first time in 28 years, and increased their numbers in the House. The Republicans also gained four seats in governors' races. The wins by Reagan and the Republicans marked the beginning of what is popularly called the "Reagan Revolution" or Reagan Era, and signified a conservative realignment in national politics. The United States in the 1970s underwent "stagflation"—a wrenching period of low economic growth, high inflation and high interest rates and intermittent energy crises. These issues played a large role in the 1980 campaign. While during Barry Goldwater's 1964 campaign, many voters saw his warnings about a too-powerful government as hyperbolic and only 30% of the electorate agreed that government was too powerful, by 1980 a majority of Americans believed that government held too much power. Events such as the Iran hostage crisis and the Soviet Invasion of Afghanistan played a large role in the 1980 elections. America was perceived by many to be weakening as a world power while the Soviet Union was perceived to be strengthening and expanding. At the time, 60% of Americans polled felt that United States defense spending was too low. Republican Ronald Reagan won the election in a landslide, receiving 489 electoral votes, defeating incumbent Democrat Jimmy Carter, who received 49. Reagan received the highest number of electoral votes ever won by a non-incumbent presidential candidate. Republican Congressman John B. Anderson, who ran as an independent and received 6.6% of the vote. Elections were held for all 435 seats in the United States House of Representatives. House Democrats won a slim majority of the popular vote (50.5%) and retained a 243 to 193 seat majority, even though Republicans gained 34 seats. The 34 seats of Class III of the United States Senate were up for election. Republicans won majority control of the Senate for the first time in 28 years, picking up 12 seats and losing none. Thirteen of the fifty state governorships were up for election. Four state governorships changed hands from Democrat to Republican. The territorial governorships of American Samoa and Puerto Rico were also up for election. ^ Jerry Lanson (2008-11-06). "A historic victory. A changed nation. Now, can Obama deliver?". Christian Science Monitor. Retrieved 2008-11-05. ^ Frum, David (2000). How We Got Here: The '70s. New York, New York: Basic Books. p. 283. ISBN 0-465-04195-7. ^ Frum, David (2000). How We Got Here: The '70s. New York, New York: Basic Books. p. 344. ISBN 0-465-04195-7. ^ "Statistics of the Presidential and Congressional Election of November 4, 1980" (PDF). U.S. House of Reps, Office of the Clerk. Retrieved 10 April 2017. "1980 Presidential Election". The American Presidency Project. Retrieved 10 April 2017. This page was last edited on 8 February 2019, at 01:05 (UTC).